Sea Fortress Suomenlinna and Okra will appeal to museum buffs. Give yourself a bit of retail therapy at Market Square Kauppatori and Kamppi Shopping Centre. 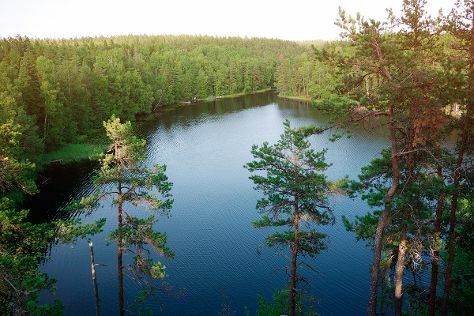 You'll find plenty of places to visit near Helsinki: Teijo national park (in Pernio), Espoo (Nuuksio National Park & Arctic Expedition) and Sipoonkorven Kansallispuisto (in Vantaa). The adventure continues: contemplate in the serene atmosphere at Rock Church, go for a walk through Uutelan luontopolku, admire nature's wide array of creatures at Korkeasaari Zoo, and trek along Pornaistenniemi Nature Trail. To see more things to do, ratings, where to stay, and other tourist information, use the Helsinki journey builder . If you are flying in from United States, the closest major airport is Helsinki Vantaa Airport. Expect a daytime high around 47°F in April, and nighttime lows around 32°F. Finish your sightseeing early on the 20th (Sat) so you can travel back home.